We're Partnering with Givemetap on a great water-based Subnautica product that saves lives. Each water bottle sold gives 1 person in Africa 5 years of clean water. Go here to purchase a bottle and help save lives! Subnautica I hate to break it to you but you are another victim of one of the many "Help the Africans" causes. There is extremely little information on their website on how they actually provide these 5 years of water to someone. It has long since been proven that many of these websites that claim to help someone out in africa are scalping a huge percentage of the profits and pocketing it for themselves. I'll bet that maybe $2 worth of the $18 you spend on that bottle actually goes to help someone out in aftrica. The rest goes into the pocket of guy on that website. Also by doing this you are damaging the economy of whatever country they are trying to "help" since this is taking jobs away from their local people. Yes, I would definetly like some more information than a vague sentence. Not that I am against helping people, but there isn't really a specific place mentioned (other than "Africa" which is an entire continent) or a specific thing stating how my eighteen bucks can provide five years worth of drinking water. Reapers have a 125% chance of stealing yo Aurora Crash Zone. Looking at the website, only 20% actually goes toward the water project, as they call them, and they only install pumps if that project reaches a goal. Eh, I wanted to write something very smart and witty here, but I'll just go and buy myself a bottle instead. I'll have the first official SN merch to show off and enjoy, and some - however small - portion of my payment will go to a good cause. Even if it's only 2 dollars, that's still 2 dollars more than would get there if the bottle was just ordinary merchandise sold in a gaming store. I'd say that's a win. Thought we'd make an account so we can address a few things. I'm just curious, do you know by any chance how exactly they determine that just one of these bottles bought=5 years of water for a person? For every bottle we sell, we take a portion of the revenue and allocate it to a fund that is used to install High Lift Afridev water pumps in rural communities in the District of Wa (Upper West Region of Ghana). These pumps typically last for 20+ years, and on average cost around $6000 to install and are used to serve communities of roughly 750 people. For every bottle sold, we give between $2.00 to our African NGO partner (ProNet North) in order to fund these water projects. The amount we give never changes although the % will fluctuate between 10 and 20 depending on the type of order. For large orders we can offer a discounted price which means the % donated is closer to 20%. Whereas for our retail orders it will be closer to 10% as the price of the bottle is $18. Also by doing this you are damaging the economy of whatever country they are trying to "help" since this is taking jobs away from their local people. In our particular case we make sure we work with the local people. ProNet North (http://www.pronetnorth-ghana.org), our NGO partner, is a Ghanaian organisation made up of local people. They help us target the rural communities who are suffering from a lack of clean drinking water. The money from your bottle purchases it used to hire Ghanaian hydrologists (to tell us where to dig) as well as a locally-based drilling company (to dig into the ground). they only install pumps if that project reaches a goal. This campaign bottle goal is not dependent on us installing pumps. 25 is merely the minimum number of bottle orders we need in order to physical print the bottles. We will be funding our next water project in Yipala Ghana helping 958 people and if this campaign hits 25 bottles it will go towards funding that particular project! Really appreciate the feedback and will definitely work to improve the messaging on our website. Oh my gosh I am so going to order one... that is so cool of subnautica and give me tap to make such a difference to these people in Africa that either don't have water or have dirty water that they have to walk miles to get two buckets of dirty parasite filled water. Excellent that Give Me Tap responded near-immediately to our concerns; it's good when a company / organization responds to feedback like this. Good to have proof that they're legit and are who they say they are, you know? FINALLY A WAY TO EXPRESS MY LOVE FOR THIS BEUTIFUL GAME! And a way to help those poor people in africa. Wow im really happy to see this partnership thing happen! 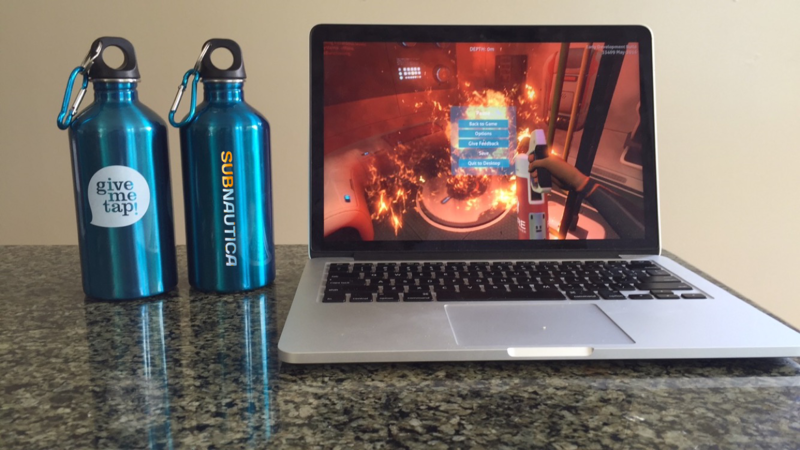 by buying this cool looking Subnautican water bottle not only do we get to support the game but we also get to help defavorized people to have something vital which is clean water. Im very hyped for this and i just bought 2 bottles, one for work and one for long travels! A MASSIVE thank you to everyone who has has ordered a bottle so far. Thanks to your purchases, our current water project has now been fully funded and drilling will now begin in Yipala, Ghana. We'd also really appreciate those who provided feedback about our messaging. We're always trying to be as clear and transparent as possible and we're definitely going to make some changes to our website. Only two more bottles left until we hit 25 and the bottles can go to print! Meanwhile the team and I are absolutely loving this game. Note: No air sacks were harmed in the making of this water bottle. Oh god this looked so cool I had to buy one, and I hardly buy anything like this. If you guys already reached your goal, did my purchase help with anything though? Even though we've now reached the target, EVERY bottle still counts. Your purchase will go to towards funding our next project which we will be announcing very soon! Now going to sticky this post as there is just 1 week remaining to get your bottles! Any idea how long these usually take to ship? Just curious since I ordered one about 6 days ago. As far as I'm aware, once the campaign ends they will be made and then shipped. Awesome. Thanks for the clarification. How long will they be available cause I really want one and I'm afraid that I might get in too late! Theorist, 2nd in Command of the PH/SP Warper Forces, Gamer! We are truly overwhelmed by how awesome this community is! We'd like to thank each and everyone of you for your orders so far. The response to this Movement Bottle has been incredible. We'd also like to say a MASSIVE thank you to Flayra and Obraxis! Thank you for giving us the green light to make these bottles happen and helping us get the word out. Also, for those of you running low on titanium, we have an extra special surprise. We're giving away one exclusive Titanium Grey bottle signed by the team! . All of you who purchased a bottle and shared the Tweet we sent you are eligible to win it. Less than 24 hours to go so if you haven't purchased one yet this is your last chance. Oh. Will there be a second campaign? Edit:I will be ordering one tonight! From what I've seen, only thirteen have been sold including mine! I'm an Aussie so in total it cost about $40.00. I'm not complaint because it's for a good cause and some people in Africa now have 65 years of water, but I was expecting even hoping that more people were willing to purchase an awesome water bottle so people in Africa get 5 years of water per purchase. Again, not complaining. It says 66 sold right there on the website link.